2013 February | Federation of North-American Explorers | Semper Parati! 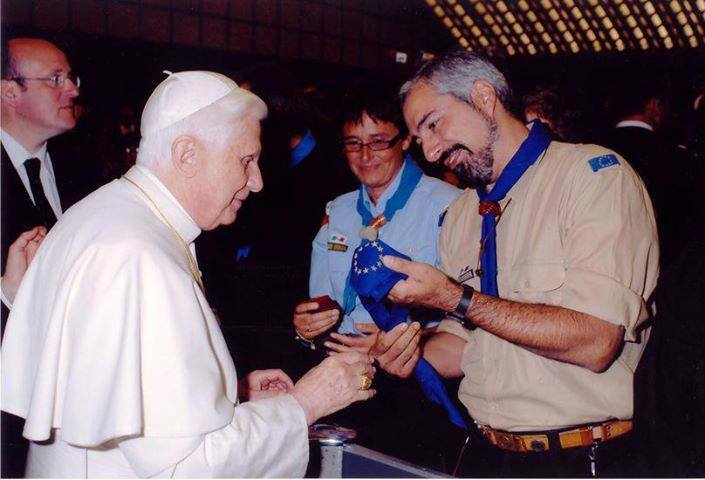 In union with the Universal Church, the International Union of European Guides and Scouts gives homage to Pope Benedict XVI for his eight years of pontificate, for his courage, his inner freedom, his witness of faith and love of Jesus Christ. We say: thank you, Holy Father! Yes, we want to thank him for his indefectible support and his friendship towards our scouting. He is a safe anchor for the 55,000 young people of our Movement, he gives them a clear orientation for the way of their life. In Cologne in 2005, in Madrid in 2011, more than 2,000 young people of the FSE, with youth from the whole world, remained with him in silence or in storm to worship the Lord present in the Holy Sacrament. We also remember with great joy the moment when, in 2006, the FSE religious advisers, gathered in Rome for a congress, prayed with him and met him personally during the Wednesday pontifical audience. In 2007, during the centenary of scouting, he sent a message to all the scout movements, in order to encourage us to be faithful to our promise and our mission. In 2008, we were full of joy when our International Union was definitively recognized as an international private association of faithful of pontifical right. The Holy Father puts an end to his mandate in the year when we are commemorating the centenary of Catholic scouting. This incites us to pray even more for him and with him. Pope Benedict XVI has just announced that, from now on, his ministry would be even more a ministry of prayer for the Church and for mankind. May the Holy Spirit inspire the cardinals who will have in March the heavy responsibility of electing his successor! In front of the present challenges and the threats against faith and morals, we are fully confident: the Holy Spirit will be able to lead the Church as He has always done and guide it towards the Reign of Christ. Like the Holy Father and after his example, we want to answer “semper parati” to the calls that the Lord makes to us in our life, day after day. With this spirit of faith, a faith that he calls us to deepen especially this year, we are entering Lent praying from now on for the ministry of the one who will be called by the Lord to lead the Church. New FNE Group in Ottawa! From our brothers and sisters to the north, we bring the great news that a new group of the Federation of North-American Explorers has been founded in Ottawa, Ontario. Our heartfelt congratulations to the new Akela and his Timber Wolves of the 1st Rideau River Group!